The building is brown colored 14 storey facing to Harumi dori st., next of Keikyu EX inn (EXCELSIOR CAFFE at 1F) ,across the street on the right side is Kyobashi Post Office.The first floor of the building has been occupied by stamp shop,tenpla bowl restaurant Tenya,and sushi restaurant Echigo Sushi and seafood restaurant Sakana Ichiban at B1. The main entrance is located between Central Higashiginza bldg. and Keikyu's bldg. Exited the station is "77 Bank"(Lawson at 1st floor) then follow thru by walking across the "Man nen bashi bridge" followed by "ADK Syochiku Square" few meters away is Central Higashigenza. Going further ahead is where the "Tsukiji Honganji Temple" on the left then at the opposite side is where the "Tsukiji Shijo Market". Upon exiting the station, you can see the Tsukiji Honganji Temple across the street of Shin Ohashi Dori. Turn right towards the Tsukiji 4 chome intersection where you can spot QB House,Tsukiji Bon Marche and on the opposite side of it is Lawson and Jonathan. Don't cross the intersection, instead turn right where you can find Central Higashigenza. There is a "National Cancer Center central hospital" in facing that places "Tsukiji Shijo" and the road when going out of the station. It extends in 4 chome in the reclaimed land intersection toward the long-cherished desire temple exceeding the market bridge intersection, and it turns in the direction of Higashi-Ginza. 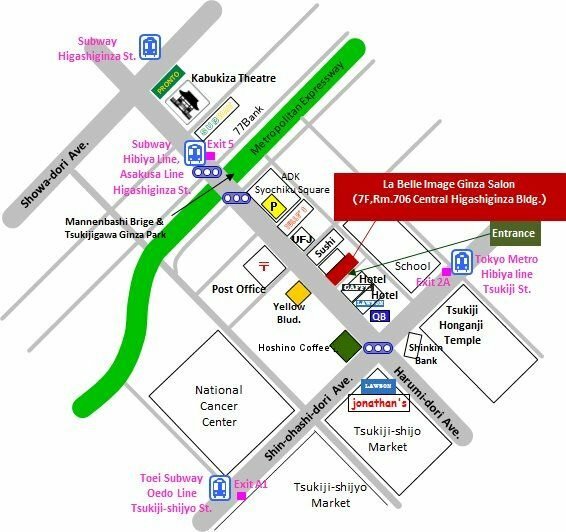 There is Tsukiji Honganji temple in the direction of travel of Shin Ohashi dori st.Walk to Ginza area after right turn on the Tsukiji 4 chome intersection (Lawson,Jonathan QB House and Hoshino Coffee). » Go to Train Rute Finder "Jorudan"
» Check "Tokyo metropolitan area railway and subway route map (PDF)"
There are "Kichijyoji Temple,""Nanpei Fukushi Kaikan Hall","Eneos"and "Gusto" near by. There are toll parking lots near by. Take a Kokusai Kougyo Bus,about 8min.ride time from the Kawaguchi St. East Exit to Asahisancyome Bus Stop.From this bus stop,it is 3min. 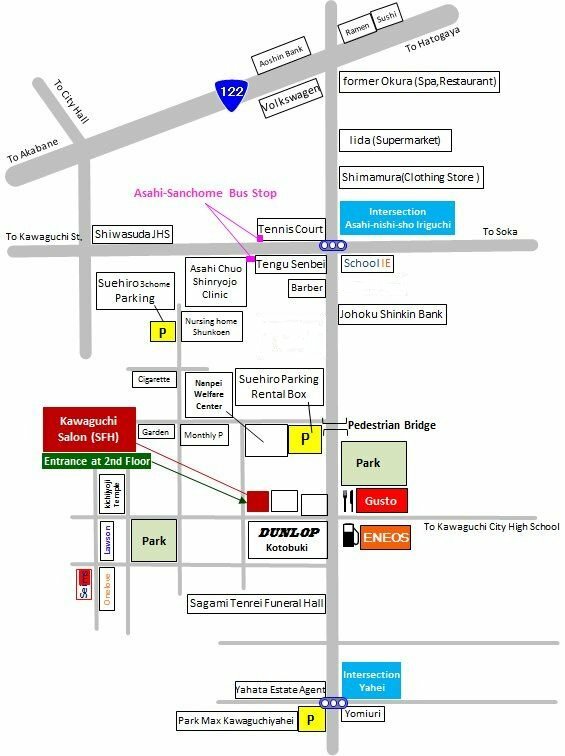 Possibele to take All Buses departure from #11 and #12 and Buses to Nishinuma departure from #14. 1.5K.There is a taxi stand in front of the station. Take a Kokusai Kougyo Bus or Tobu Bus,about 20min.ride time from the Soka St. East Exit to Asahisancyome Bus Stop.From this bus stop,it is 5min.